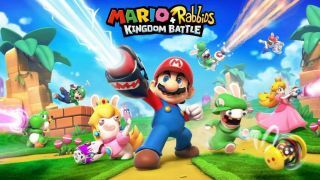 But Mario x Rabbids Kingdom Battle, the latest crossover from Ubisoft and Nintendo, looks just downright weird. While you would never guess it from the artwork, the game is going to be a strategy role-playing game – think Final Fantasy Tactics or Fire Emblem and you'll be on the right track. The game blends the two universes and, according to some leaked marketing materials, offers "the best of two worlds". We'll believe it when we see it. Mario + Rabbids Kingdom Battle was supposed to be unveiled at Ubisoft's upcoming press conference but, well, sometimes the best laid plans of mushroom men and mutated rabbits don't pan out how you'd expect. According to the images found by Nintendo World Report, the game will be about 20 hours in length, offer eight playable characters and contain four worlds to discover. The game also might have a co-op mode as well. Unfortunately, however, without a direct confirmation from Ubisoft about the game we're not totally sure the marketing materials are legit – but, given the leaks that have preceded today's marketing foible, this is likely the real deal. Mario + Rabbids Kingdom Battle is reported to come out in the fall of this year (August or September) on the Nintendo Switch.